Public Quests provide different kinds of rewards than we’ve seen in the past. Right now there are 2 Public Quests: Storm Gorge which is Southeast of Thurgadin and the Ring War which is Northeast of Thurgadin. There are plans to add several more Public Quests as we heard about in Beta (possibly the Sleeper!). When do the Public Quests (live events that any player, from solo to a full raid of 24, can participate in) run? Storm Gorge runs at even hours — noon, 2, 4, 6 etc. while Ring War starts on odd hours. So one of them starts every hour on the hour. One day only! Get a free character transfer token from the in-game Marketplace and choose your own server. Up to five moves allowed per account. UPDATE: Transfers are only valid on this day. All moves must be made during this day’s promotion. The item is NO RENT and will disappear after the day’s promotion is over. Everyone who logs in on Launch Day, February 22nd, will receive an Othmir illusion potion. (Even those who aren’t playing in Velious!) The potion has 50 charges, and is available one per character. Just be sure to log in each of your characters during the day to claim a potion, if you want the illusion for more than one character. This event will run at least until 10am pst (1pm cst, 18:00 gmt). According to some posts by SmokeJumper, this may be extended especially on Everfrost and Freeport which weren’t up until late last night. 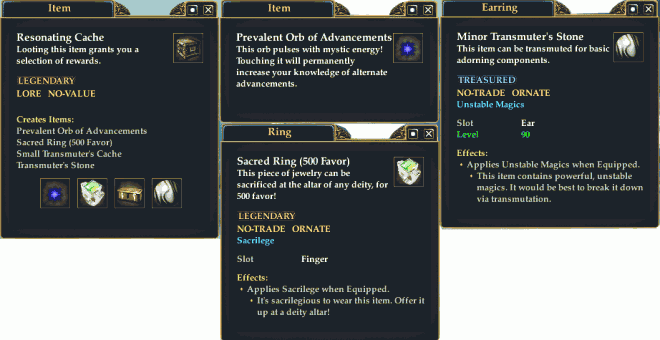 Remember, to claim this item, go to the Marketplace and select Expansion, then Nipik’s Gift. Build up your guild and your guild spirit with Double Guild XP, today only! Not to look a gift horse in the mouth, but this seems an odd day to do Guild Double XP. It will likely give something to do for people who didn’t buy Velious or don’t have a level 86+. One day only! Get a free character transfer token from the in-game Marketplace and choose your own server. Up to five moves allowed per account. NOTE: This is transfers WITHIN an account, but not BETWEEN accounts, as this still requires the involvement of Customer Service. Every day’s a snow day in Velious, but today you’ll find lots of cool prices on frosty-themed items in the Marketplace. The Twelve Days of Velious! We’re celebrating the launch of Destiny of Velious with twelve days of events and special offers! February 18-22: President’s Day Bonus XP Weekend! On the first four days of Velious, enjoy bonus adventure, tradeskill and AA experience! This event runs from 10:00 am PST on February 18th until servers come down on Tuesday morning (currently scheduled for 3:00 am PST on February 22nd). In honor of President’s Day, SOE is presenting special offers and events in many of our games, and you won’t want to miss out! EverQuest® II and EverQuest® II Extended: It’s a Bonus XP Weekend, from 10:00 am PST February 18th until the servers come down on February 22nd! Enjoy the bonus on adventure, tradeskill and AA experience! 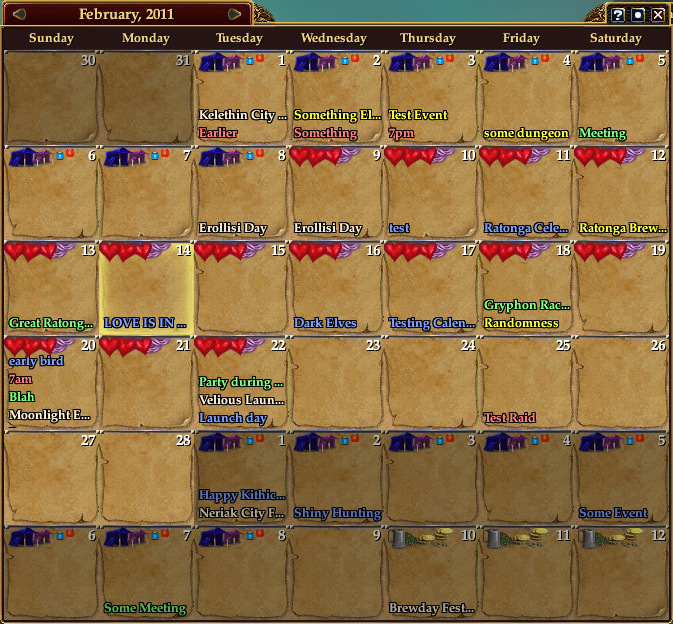 GU59: In-Game Calendar and Ready Check! 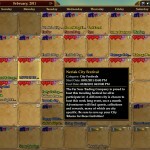 If you have longed to be able to organize Guild Events into an in-game Calendar, post a Raid Schedule, or get a reminder on which City will be visited next by the roving City Festival, you’ll be pleased to see the addition of a Calendar in Game Update 59. 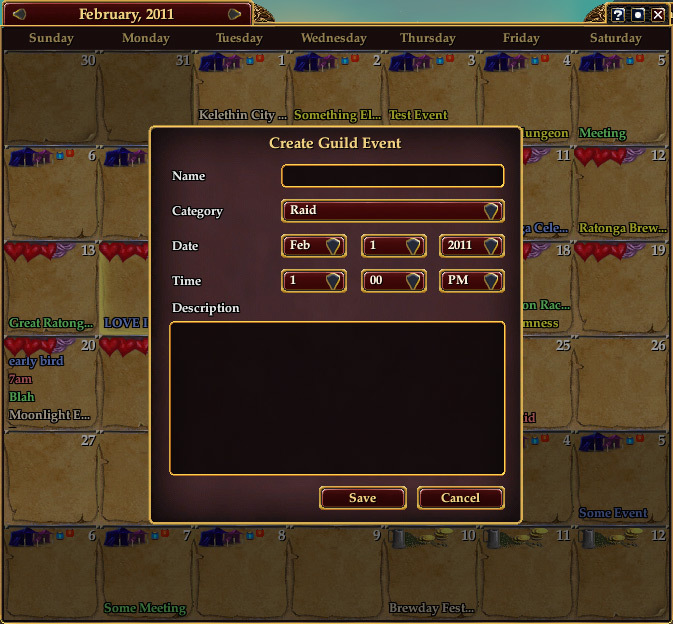 The calendar will be populated with Live Events, possibly Server Events posted by Community Managers, and also your Guild leadership will have the ability to add events (it’s gained a new permission under Guild Ranks). Raid Leaders can now initiate a ready-check by right-clicking the raid window. Raid members in the current zone will be asked if they are ready and the results will be displayed in the raid window as well as in raid chat. NOTE: This is a PREVIEW. Additional features and tweaks may occur to render these screenshots outdated. An issue that stops ambient characters in city zones from wandering has been fixed. ‘Follow’ should once again be an option on group member’s right-click menu. Sister Thog Macgilly will now update the quest “Premonitions of Disaster” even while Erollisi Day is being celebrated. Creatures within the Shard of Love now have a significantly higher chance of dropping love loot while Erollisi Day is being celebrated. A ton of in-game events are coming up, including some run by media sites, some run by players, and some by the Community Relations Team! Have you made plans to attend yet? This week, Karen from Massively will take a closer look at the mentoring system in EverQuest II. She’ll cover the basics of how to mentor down in level, highlight the chronomage system, and then take a trip into Deathfist Citadel, a lower-level instance from the original EverQuest II that remains one of her favorite zones. Let’s hunt some orc! Click here for the Livestream link! Check out EverQuest2.com for more details of the upcoming Player Events on Antonia Bayle and Lucan D’Lere, as well as the Community events on Feb 15th and 17th. After yesterday’s update activated the Erollisi Day event, some players were reporting crashing issues in Halas. Others reported issues in Antonica as players were able to spawn unlimited gazebos. An interim fix for the Halas issue was implemented, with today’s update providing a more permanent solution. Also, last year’s quests are now repeatable. All of the issues with Erollisi Day were spelled out in this thread. Erollisi Day events are now live in EverQuest II! Log in to find new quests, crafts, house items and more! Love letters will be sent, gifts of chocolate and flowers will be exchanged, and romance will be in the air. Are you in the mood to celebrate St. Valentine’s Day in a non-traditional way? The SOE Community Team knows just how you feel! Join the Community Team along with some members of SOE Development Teams as we chat about the upcoming in-game Valentine’s Day-themed activities. Learn more about what’s going on in-game for our Valentine’s Day celebrations straight from the folks that work on the games you love to play. Also on the agenda for this Webcast is a little surprise. We hope you will join us on February 3, 2011 at 4:00 p.m. PST to see what this entails. Tune in on Facebook or on Stickam to watch the first webcast this Thursday! Friday, February 4 at 4:00 pm PST: Join Dave “Smokejumper” Georgeson and Rich “Waters” Waters as they talk about itemization in Destiny of Velious. They will again be answering questions from our players, so submit your questions through the forum links below. Should I stay up until 2:30am to cover this AND tomorrow night’s webcast too? Sleep is overrated, right? If you tune into the SOE Webcast on Thursday, 4pm on Stickam (or the Stickam tab on our Facebook page) you should find Kaitheel talking about Erollisi Day and a few devs from other games talking about their holiday events. Erollisi Day will be activated on all servers (international and & test included) Wednesday Feb 9th. 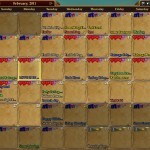 Erollisi Day will be deactivated at the end of day on Sunday Feb 20th for most servers. For servers that are affected by merges during the event’s time period, we will extend Erollisi Day to the end of day on Monday Feb 21st. There is going to be an NPC that exchanges any of the different love loot (notes or candy) for a single type. It’ll function exactly like the [Nights of the Dead] candy trader did. That should help with the inventory! We haven’t posted about City Festivals in a while so thought we’d repost this one. If you have completed city tasks such as tradeskill writs and adventure writs, you’ll notice you have received City Tokens. These tokens can be used to buy items from the travelling merchants of the City Festival. 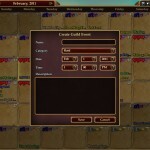 Each month, a few unique items are available only to each city (including themed tiles, dividers, and columns), as well as a selection of items which are always available. This month, the festival is parked at the gates of the City of Kelethin in Greater Faydark. UPDATE: January awards will not be delivered until Wednesday. We had a little snafoo on the back-end. I actually do have new screens of the puppy coming later today! 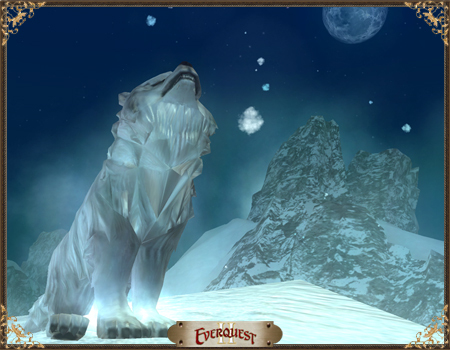 On Tuesday, January 18, qualifying EQII and EQ2X accounts who have met the requirements for Velious Winter Rewards will find a new bag in their /claim window which contains two new items; an Ice Wolf Pup and a Superior Potion of the Advanced. The puppy also isn’t just a shrunk down wolf . He’s a brand new model with exclusive puppy animations. The Superior Potion of the Advanced grants a bonus to all three types of XP at once; achivement, tradeskill and adventure. This potion will increase your XP gain for all three by 100% for a duration of two hours. The potion is for characters higher than level 10. Still need to finish some of your Frostfell quests, and get those last few once-a-year items? Well you’re in luck! Enjoy a little more time with the festivities and stuff your pockets full of as much Frostfell goodness as you can, until the hotfix on Tuesday morning, January 11th! The festival is now active on those servers (Butcherblock and Permafrost) and has been for a while, but did start almost a day late. We will extend the event on the affected servers. 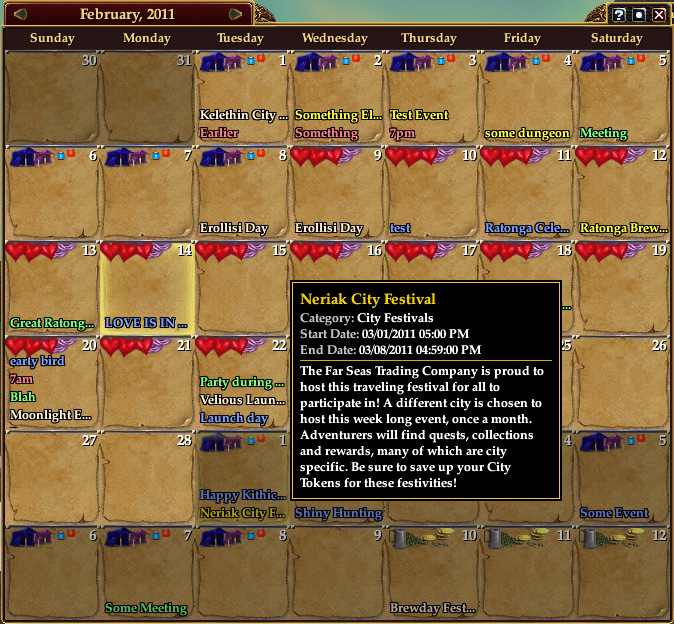 The Gorowyn city festival on Butcherblock and Permafrost this month will end at 11:59pm on the 8th [07:59 on the 9th GMT]. (The festival will still end on all other servers at 11:59 on the 7th). Apologies for any inconvenience! SOE are trying something new with their EQ2 Bonus XP this time around. Past Bonus XP events have taken place over a weekend or during the holidays which has been good for some players, but not so good for others who are visiting family or working over the weekend. So this time around, the Bonus XP event is a Double XP Weekendish. We’re doing Double XP Days from Dec 27th (Monday) to Dec 30th (Thursday). Most of you will be shocked to hear that we’re doing Double XP not actually on one of the holidays and on weekdays instead of weekends. Don’t fall down in shock. Of course some players are not happy with the new arrangement. I’m not sure they could do an XP bonus event that would appeal to all players without running it for 2 weeks. I predict (educated guess) we’ll see some type of XP bonus in the days or weekend before Velious launches. Yes…but I have to stay mum about details until the announcement is ready. It looks like Frostfell was patched in early today, instead of the expected December 9th. EQ2 ZAM has their updated guide ready to go for Frostfell 2010 if you need a refresher, as well as info about the new quests and events. If you’d like to browse the complete catalogue of Frostfell-related items, look no further than the comprehensive EverSeek which documents an astounding 285 Frostfell items and exactly how to get them. Don’t forget to check out Niami Denmother’s EQTraders tomorrow with news about that new Hua Mein (panda) furniture as well as coverage of Frostfell 2010. SOE have brought back their StationCash Discount program ‘Super Fan’ again, this time offering 25% off and 35% large denominations, as well as special items each day for SOE’s major games. Remember, StationCash can be used for character slots (normally $10 to buy a lifetime character slot), character transfers, and other items. And in time for Frostfell, StationCash items can now be gifted to other players. The Heroes’ Festival is SOE’s celebration of the anniversary of EverQuest II. This will mark the 6th year since EverQuest II premiered. There are a series of repeatable and nonrepeatable quests which reward various house items as well as a collection. Absent this year are the player-made paintings introduced during last year’s brief event. EQ2 ZAM has updated information on the quests and events going on in this year’s Heroes Festival. Today’s hotfix notes include the ability to relocate your City Bind Point to any city you are aligned with, more crafted Marks of Manaar equipment, and other changes to live events and raids.